A copy of Braineater Jones was sent to Confessions of a Reviewer by the author Stephen Kozeniewski in exchange for an honest review. This is said review. Another new one on me. Never heard of Stephen Kozeniewski before he sent me this through Confessions, for a review. I love it when new authors (to me) take the time to contact me and push their stuff for a review. You sometimes get stuff that, to be honest, I put down after a page or two. Sometimes you get stuff like this. Looks a bit bizarre and maybe not in your normal reading piles but worth a shot. Imagine my surprise when I noticed Mr Kozeniewski’s name in an anthology I started to read at the same time. Coincidence? I think more fate. After reading Braineater Jones I’m going to jump straight to his story in the anthology. He is rather bloody good. A man awakes face down in a swimming pool. Well, he doesn’t really wake up. That’s because he is dead. The huge hole in his chest sort of points to that. He has no idea where he is, who he is, what happened to him or where he needs to go. He adopts the name of Braineater Jones and sets about tracking down his killer. His only friend, it appears, is an “undead” like himself. Problem is, he is only a head with no body and pretty useless in a bar brawl. 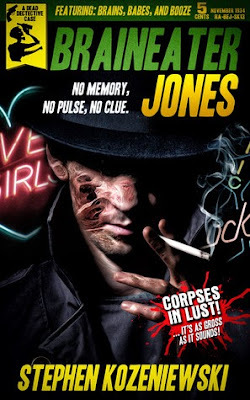 After discovering that the only thing that will keep him from craving the human flesh he is naturally attracted to is alcohol, Jones and the head embark on a mission to find a constant supply of booze, solve a few cases as PI’s and find Jones’ killer before their time runs out. First question – how to categorise this? That is such a hard question. The story is set in November 1934. You read the story through the eyes of Jones, reading his entries in his own personal journal from 31st October through until 1st December. Each day describes what has happened to him and the “head” in their quest for booze and answers. That is really all I want to give you on the plot itself because you need to read this to follow the journey yourself. You really need to read it! It’s noir. It’s horror. It’s dark fiction. It’s full of dark humour. Most of all this is just pure, absolute fun. I absolutely loved it. The atmosphere is perfect. You have a dark, almost smokey feeling which sets the scene perfectly. You can imagine Bogart or someone of that era playing parts in this story. Every time someone walks into a bar you can sense the music playing in the background, the sights, and the smells. It stinks of the 30’s during prohibition. That’s what absolutely makes this book. You have to remember at points that the main character is a zombie for crying out loud. We only see zombies in modern day movies that leave a lot to be desired. I noticed someone say they could see this made into a film with Bruce Campbell as Jones. I couldn’t think of anything more perfect. This would become a cult film. This should become a cult book. It is that good. Zombies that walk and talk and think and have their own place in society as long as they drink alcohol! I want to be a zombie in the 1930’s. Hidden within the main story are little snippets of side stories that bring you back to reality. There are Nazi’s in this. Americans collaborating with Nazi’s just before the Second World War. Whether intentional or not, it examines the culture of that time period. The racism, the homophobia, the language used, talking about women as dames and reminding them of their place in society. It’s not in your face but it does remind you of how it must have been to live in those times. And it has zombies!!! In the 1930’s! To summarise: It has zombies! In the 1930’s! This is not your typical zombie story. I loved that fact. It oozes noir. It oozes atmosphere. It is a horror of sorts but if you are expecting jump out of your seat scary, then it is not. It is very dark with a lot of dark humour. It will make you cringe and laugh at the same time. It will make you root for the underdog. It’s just good fun and well worth the time it will take you to read it. I for one cannot wait for more from Mr Kozeniewski. ★★★★★ Absolutely loved it and it comes highly recommended. ★★★ Creepy but could have had more. 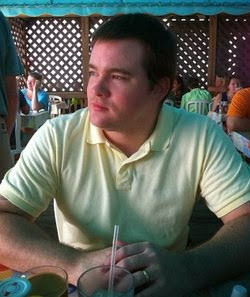 Stephen’s author page can be found here.